During campouts, hiking adventures, regional seminars, and special events, TAPS Youth Programs strives to provide one-on-one mentoring for bereaved military children and teens through the legacy and military mentor program. That’s where you come in. A military mentor is someone who currently serves in the military or is a veteran and can be a caring companion and a reminder to TAPS kids that the military still cares for them. A legacy mentor is a military survivor who has graduated from Good Grief Camp and is ready to support younger survivors who will follow in their path. As a mentor, you’ll be a buddy to a brave child throughout the event as they share and connect with other surviving kids and learn how to honor their loved ones. You may do art projects and play silly games. You may throw footballs and cheer them on in relays. You’ll definitely create lasting memories and feel pride in yourself for the work you’ve done. 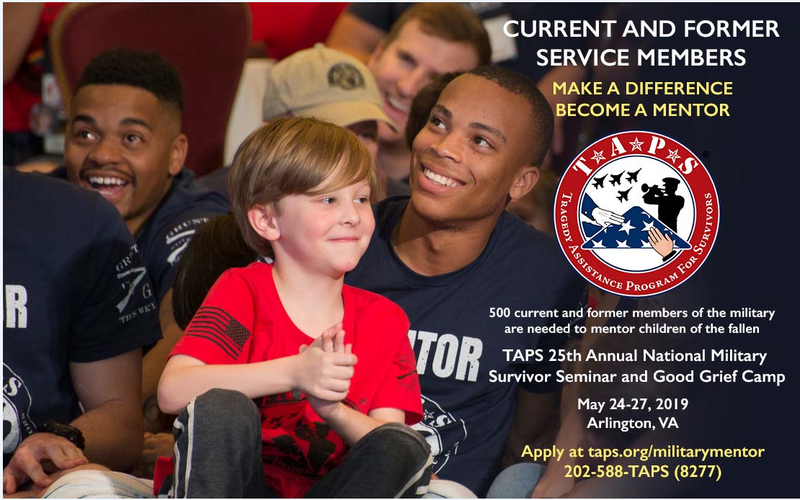 By volunteering as a legacy or military mentor, you can be a source of hope for a TAPS child.